“Stop Wasting Your Vote!! !” has been told to me over and over again in the last few years. It’s because I am a write-in kind of guy. Friends and colleagues tell me I live in a battleground state and that I must help prevent the hated blues or reds from winning the election. It falls on deaf ears. I wasn’t always this way. I used to take part in this grand charade. I used to believe that voting for my preferred party was essential to preventing the other idiots from ruining things. I know I am not alone. I doubt anyone would be able to count the times they’ve heard, read, or thought the phrase “lesser of two evils” as it pertains to politicians. I know I cannot. We vote for our party even though we are aware of the horrible skeletons our candidates have in their past. Whether it is the receipt of hidden payments from mega-corps or the use of public resources for personal benefit, being an openly corrupt politician does not prevent anyone from getting elected if they can portray themselves, for a few months in an election year, as a lesser evil than their opponent. This is the American people’s fault. Not the politicians or awful media. 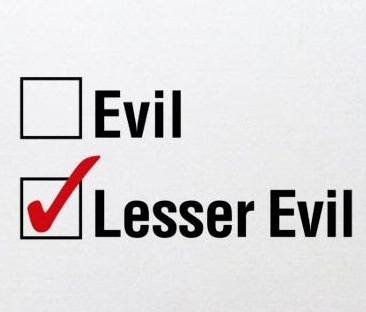 Everyone knows that voting the lesser of two evils is still voting for evil. But when election season rolls around, everyone forgets their distaste for politicians and seemingly resumes a quadrennial job as a political cheerleader, spouting whatever campaign slogan that has been provided and ignoring all negatives. This continues primary after primary after primary…general election after general election after general election…forever…the lesser of two evils. No one seems to realize or care that by continuing this behavior, they will one day die having spent their entire life only voting for evil. In my humble opinion, that is what I call wasting your vote. Elections are not horse races. We normal people don’t get paid on a ticket for picking a winner. Never acquiesce your vote to who you think has the best chance to win and never vote for the lesser of two evils. Your vote is sacred. It is your only real measure of control over your government. Your only chance of putting people in power who’d make the world a better place. Don’t sell it out. Only vote for whoever you truly believe in. Even if it means you must write-in your friend, your coach, your professor, your boss, your employee, your spouse, your parent, your mentor, or some person you’ve known about. Vote for someone honest. Value integrity more than ideology. These corrupt political parties do not deserve your support. Blindly supporting them despite their flaws only ensures their behavior will never improve. Withdrawing your support from either party and seeking out honest candidates would, at worst, finally incentivize both parties to improve their behavior and start holding their members accountable. At best, we might actually find there are plenty of honest Americans throughout this great land who could do the job better than the red and blue snakes we have been electing. I am asking you to try it. To vote for whomever your heart believes in without compromise. If only just one time in your life, be bold enough to not vote for evil. This way, when you die, you will have the comfort of knowing that you voted for good at least once.